Waiting to be eaten. 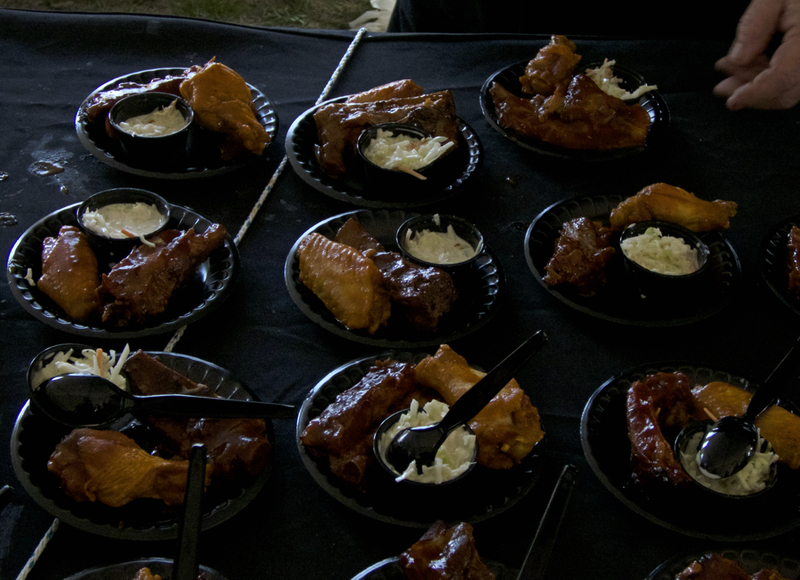 Wings and ribs at the 2016 We just checked the weather forecast for Friday and now there’s no excuse for missing the Joe Lamb Jr., & Associates BBQ & Wing Showdown. We just checked the weather forecast for Friday and there’s no excuse for missing the Joe Lamb Jr., & Associates BBQ & Wing Showdown. Held at the Event Site in Nags Head, the weather is certainly cooperating. The latest forecast calls for sunshine and temperatures in around 60 degrees. It’s really looking as though the weather gods are smiling on the event this year, although we know from experience that even if it’s a bit chilly or maybe raining little, the show must go on. Of course, with the event under a huge tent, the weather may be an inconvenience but we’ll still have a great time. The Outer Banks Taste of the Beach is a four day event, Thursday through Sunday, that includes special preparations, multi course dinners, wine and beer tasting and a some major events. In many ways, the TOB is mini-tour of the Outer Banks with events scheduled from Corolla to Manteo. It’s tough to pick out a favorite with so much happening. The BBQ & Wings showdown is, of course, our absolute favorite of the weekend, but two other events we have had fun attending in the past is the Chowder Cook-off on Saturday at Southern Shores Crossing and any one of the wine or beer pairings they do at Trio in Kitty Hawk. That does come with a caveat—we have never had a bad time at any event. There are a couple of other events that may be worth checking out if eating great food and sipping wonderful libations becomes tiresome. The Outer Banks Forum of the Lively Arts will be presenting Barefoot Movement at the First Flight High School auditorium on Saturday evening. The Barefoot Movement is at the forefront of what is being called nugrass—sort of a new way of thinking about bluegrass. For theatre goers, check out the Manteo High School’s production of Phantom of the Opera Friday, Saturday or Sunday. The kids consistently do a remarkable job with some very difficult material, so this may be a great one to see.